The aim of the project is to overcome the substantial lack of knowledge that still exists with regard to the underlying dynamics of human mobility. Drawing upon the migration-violence nexus developed by Bank et al. (2016) and based on a broader concept of structural violence, the objective is to examine migration as a movement from violence, through violence and into violence. The added-value of this project is to focus on migrants’ perspectives, to be empirically collected through field studies in Turkey and Germany. We hold that migrants are not ‘masses’ that are passively channeled by human traffickers on the one hand and governmental migration regimes on the other, but actors with their own logics of action (Jünemann et al 2014). By taking migrants’ agency seriously we want to reassess problematic assumptions that determine the hegemonic discourse on migration underpinning governmental policies and societal processes of (non-)integration. We will conduct an interview-based empirical research that focuses on migrant narratives in order to (i) enrich academic knowledge, (ii) revise the general public discourse (iii) and better inform policymaking. Panel in cooperation with Julia Simon (HSU) on „Borders and Boundaries in the Euro-Mediterranean Space“, 11th Pan-European Conference on International Relations in Barcelona, September 2017. Workshop in cooperation with the German Institute for Global and Area Studies (GIGA) on „Migrants‘ Agency“, HSU December 2017. Annette Jünemann (under review): From pity to social empathy: Overcoming asymmetries in the relationship between refugees and their volunteer supporters. Annette Jünemann (2017): Emotions matter. Fear and (non-)empathy in German reactions to the “refugee crisis” In: Annette Jünemann, Nicolas Fromm, Nikolas Scherer (eds. ): Fortress Europe? Challenges and failures of migration and asylum policies, VS-Springer, 167-184. Safouane, Hamza (2017): Between Hospitality and Inhospitality: The Politics of Migrants Protection in Germany. Spectra, Vol 6, No 1 (2017). How are foreign policy decisions made and how are international crises solved? These questions continue to be of crucial interest for scholars of political science and international relations. While some approaches tend to focus on the systemic level of analysis, others were developed to grasp the decision-making procedures themselves. Most of the literature remains committed to the ideal-type of rational choice. Obviously, a perfectly rational procedure can hardly be observed in practice, where ministerial standard operating procedures and state bureaucracy’s tendency to inertia prevent that the best alternatives are always taken into account when it comes to taking decisions. Rational decision-making is further impeded by the fact that decision-making groups sometimes tend to build up their “own norms and consensus at the expense of clear and critical thought” (Köni 1987, 159). This project aims to tackle these imperfections from a new angle and explore for an alternative outcome-oriented approach by introducing an alternative, more ‘designerly’ way to problem-solving. Since traditional, that is rational or deductive, problem-solving tools prove to be unavailable or ineffective to solve complex problems, “designers move through iterative phases of thinking and doing” (ibid. ), alternating between “logic and certainty” and “raw creativity” (Martin 2009, 2). Through such “dynamic interplay”, the designer is supposed to solve a problem “in ways that create value, profit and greater ease of application” (ibid.). This involves the application of specific tools to perform the tasks in line with the objective to find a way out of the problem to be solved. At first sight, the concept of such “Design Thinking” might appear to be hardly applicable to the area of foreign policy decision-making. However, a closer examination of the approach reveals promising pathways for conceptual translation into the sphere of international politics. Thanks to the alternation of theory and practice, as provided by the Design Thinking process through simulations and testing, the procedure allows for an effective pre-warning system with regard to bias, false reasoning or ‘groupthink’. A sort of prototyping might raise greater awareness for the stakeholder perspective and potentially challenges rigid belief systems that risk impeding a sound foreign policy decision. However, the (over-)emphasis of innovation could also be read as a potential risk in the context of foreign policy decisionmaking, where the stakes tend to be higher than in the business world and the risk of failure cannot be handled as easily as during the process of designing of a consumer good. In addition, the question arises, whether state agencies such as the Foreign Office and other entities entitled to formulate foreign policy would be able and willing to transform accordingly and open up to “embed” Design Thinking within their structures and procedures. This research project aims to orchestrate and observe the application of Design Thinking tools in a foreign policy decision-making setting. Accordingly, the research centrally involves organizing workshops, bringing together ministerial staff and other experts of foreign policy evaluation and decision-making. The workshop objective should focus on designing creative approaches to specific foreign policy problems. Would diplomats, politicians and analysts come to diverging results if they were to creatively approach a specific situation as designers compared to using traditional patterns of analysis and decision-making in the field? Under the reign of Emir Hamad (1995–2013), Qatar seems to have succeeded in (re-)defining itself in the international realm. The stunning rise of the country from a background actor to a protagonist of international diplomacy has been puzzling the academic community ever since. Still, most approaches limit themselves to the diagnosis of some kind of “strange power” (Eakin 2011) and its manifestations, leaving questions about the underlying mechanisms largely unanswered. Being short of conventional, that is, military and economic resources, Qatar might rely on some sort of ideational or normative component of its foreign policy strategy. Accordingly, this project proposes a clear-cut theoretical argument based on the combination of constructivist and rationalist reasoning, drawing upon the research hypothesis that small states could strive to make use of a norm-based logic in order to compensate for their geopolitical inferiority as expressed in conventional neorealist terms. The case study on Qatar’s Middle East diplomacy between 1995 and 2013 was conducted following the procedures of qualitative content analysis. Through an analysis of text documents such as press interviews with the Qatari leadership or official statements by Qatari diplomats, the study inquires whether Qatar’s international status could be founded not only on the compliance with established international norms, but also on the country’s efforts to actively contribute to shaping them. As the findings illustrate, Qatar’s diplomacy indeed shows a very distinctive use of norm entrepreneurship: instead of engaging in norm advocacy, in other words the promotion of pre-existing norms, Qatar seems to aim at normative innovation by introducing new normative content into international debate (norm crafting). To unfold this norm crafting potential, Qatar seems to have imitated the attitudes and attributes of established norm entrepreneurs such as international organizations. The strategic character of Qatari norm entrepreneurship is also reflected in explicit references to its ‘special role’ in international affairs. The newly ‘crafted’ norms themselves are mainly centred on economy- and business-inspired concepts such as efficiency. Transferring a thoroughly capitalist logic to the diplomatic sphere and hence redefining the terms of the debate might have helped Qatar in upgrading its international status. However, the project also points to the limits and inconsistencies of Qatar’s strategy and concludes by evaluating the broader applicability of such constructivist niche diplomacy. Although women made an important contribution to the ‘Arab Spring’ in the year 2011, they are no longer playing a comparable role in the reorganization of political life in the Arab transition countries with the only exception of Tunisia. In all research projects on Euro-Mediterranean relations and political processes within the MENA region, I include a gender perspective. For example, I problematize the difficulties and contradictions in EU attempts to promote gender equality in the newly evolving political orders of its southern partner countries. Before the ‘Arab Spring’, the EU has been supporting the agenda of secular women’s right groups, paradoxically in tacit agreement with the authoritarian regimes of the region that pursued a kind of secular state feminism as an instrument in the fight against political Islam. Since the Arab Spring, this promotional practice of the EU appears anachronistic. To adapt the external promotion of gender democracy to the new political realities is perceived in Europe as a dilemma: How to cope with Islamists if women’s rights are at stake? I argue that the lack of gender equality should not be taken as a problem of especially Muslim societies. It’s rather the European perception of Islam, informed by stereotype narratives and binary identity constructions that created the so-called Muslim exceptionalism. EU perceptions are shaped by a logic of culturalism that reduces the patriarchal character of MENA-societies to the seemingly backward ideology of political Islam. As a result other impact factors for gender injustice are blurred and potential partners for cooperation are overlooked. Jünemann, Annette (2017): Zum Wandel arabischer Geschlechterdiskurse in Zeiten von Repression, Restauration und Bürgerkrieg. In: Demmelhuber, Thomas / Paul, Axel / Reinkowski, Maurus (eds. ): Arabellion. Vom Aufbruch zum Zerfall einer Region? Leviathan, Special Issue 31/2017, 303-324. Jünemann, Annette (2014): Geschlechterpolitik für die arabische Welt: Die EU-Förderpolitik zwischen Staatsfeminismus und Islamismus. Heidelberg: Springer VS.
Jünemann, Annette (2013): Facing a Dilemma. EU Promotion of Gender-Democracy After the Arab Spring. In: Horst, Jakob / Jünemann, Annette/ Rothe, Delf (eds. ): Euro-Mediterranean Relations after the Arab Spring: Persistence in Times of Change. Farnham: Ashgate Publishers. 39-58. Jünemann, Annette (2013): Geschlechterdemokratie für die Arabische Welt. Die EU-Förderpolitik zwischen Staatsfeminismus und Islamismus. In: Jünemann, Annette / Zorob, Anja (eds. ): Arabellions: Zur Vielfalt von Protest und Revolte im Nahen Osten und Nordafrika. Wiesbaden: VS Verlag. 307-334. Jünemann, Annette (2012): Annette Jünemann contributed as an expert to this study. Study requested by the European Parliament’s Subcommittee on Human Rights: Agapiou-Josephides, Kalliope / Benoit-Rohmer: Enhancing EU-Action to Support Universal Standards For Women’s Rights During Transition. Florence. EXPO/B/DROI/2011/24 /November/ 2012 PE 457.119. Jünemann, Annette / Klement, Carmen (eds.) (2005): The Policy of Gender Equality in the European Union. Schriftenreihe des Arbeitskreises Europäische Integration e.V. Baden-Baden: Nomos. „Zum Wandel arabischer Geschlechterdiskurse in Zeiten von Repression, Restauration und Bürgerkrieg.“ Presentation at the non-public research workshop on the topic: „Frauen als politische Subjekte in der Türkei und darüber hinaus“, TürkeiEuropaZentrum at the University of Hamburg, 15 July 2017. „Der Arabische Umbruch als Folge von akuten Generationen und Geschlechterkonflikten.“ Jahreskolloquium des Arbeitskreises Europäische Integration e.V. zum Thema: Der Beitrag der Europäischen Union zur Stabilisierung des Nahen Ostens und Nordafrikas, Universität Mannheim, 1.-2. December 2016. „The European Union and the promotion of gender democracy after the Arab Spring“. Presentation in a conference on „Interpreting the Mediterranean today“, European Institute of the Mediterranean, Barcelona, 14 May 2015. “Facing a Dilemma: The EU and the Promotion of Gender Equality after the Arab Spring.” Presentation at the international congress of the German Middle East Studies Association, Münster, 24 September 2013. The EU’s promotion of Genderdemocracy in the Arab World. Between Statefeminism and Islamism, 14th Mediterranean Research Meeting, Workshop 1: Women, Social Change and Development in the New Middle East, Mersin (Turkey) 20-23 March 2013. EU Promotion of Gender Democracy after the Arab Spring: Easier said than done. Second Workshop in preparation for a Study commissioned by the European Parliament, European Inter-University Centre for Human Rights and Democratisation (EIUC), Venice 21-23 April 2012. According to its treaty, the EU is a community of values attached to the principles of liberty, democracy and respect for human rights, including women’s rights. The external promotion of democracy and human rights is a self-imposed duty of the civilian power Europe, codified in the EU-treaty in all the articles dealing with EU external relations. When the Cold War ended, the EU started to put this normative dimension of its foreign policy into motion, not only in its eastern but also in its southern neighbourhood. Since the beginning of the Euro-Mediterranean Partnership in 1995, the EU has emphasized its ambition to promote democracy in the autocratically governed states in the Middle East and North Africa (MENA). The normative bias of EU foreign policy, however, was repeatedly challenged or bypassed by overriding policy goals and/or diverging interests of specific EU-member states. All too often words were not followed by deeds. For the EU, which has extremely dense yet almost exclusively intergovernmental relations to its southern neighbours, the Arab Spring was an embarrassment, because it revealed the credibility gap between the EU’s normative rhetoric on democracy promotion and it’s “Realpolitik” of unconditioned cooperation with the autocratic regimes. EU democracy promotion is not driven by normative considerations alone, but serves also – and perhaps even foremost – as a strategy of EU-security policy. Inspired by the theorem of democratic peace, the European Security Strategy (2003) already mentioned the EU’s interest to be surrounded by a ‘ring of democratic friends’. Democracies are believed to be more reliable and predictable than other regimes, using peaceful means of conflict solving at least among each other. With regard to its southern neighbours, however, the EU felt confronted with a dilemma. Being convinced that Arab autocracy is insuperable and misperceiving the aspirations and capabilities of modern Arab society, the EU opted for the autocratic regimes. They seemed to be the only reliable and predictable partners with regard to core interests of the community: Keeping down political Islam, fighting international terrorism, holding back migrants, and serving Europe’s growing energy-demands. Following the genesis of EU Mediterranean policies from the EMP (1995) to the European Neighbourhood Policy (ENP 2004) to the Union for the Mediterranean (UfM 2008) one can see that the EU has ceased step-by-step its bottom up approach of democratization. Civil society, which had always played a marginal role in interregional relations, became almost absent in the institutional frameworks of Euro-Mediterranean cooperation. Today we know that this policy was a failure, since it produced neither democracy nor stability, but a huge credibility gap. As a lesson learned from the Arab Spring, the EU came up for a short period with a new approach of democracy promotion. This policy change, however, did not last very long. Today Euro-Mediterranean relations are dominated by short-term strategies, predominantly in the context of the highly securitized issue of migration. Political and economic root causes for the manifold problems within the MENA region are not in the focus of the EU’s regional policy. For my ongoing research on the issue since the Mid-1990s, including gender-democracy as well as the decisive role of civil society, please refer to my list of publications. The Logics of Action (LoA) approach was developed in an international and interdisciplinary research project led by Annette Jünemann and her team to enrich the discourse on Euro-Mediterranean relations. This discourse is all too often based on binary and mono-causal explanations for (inter-) regional problems and calamities. Narratives of “the backward Muslim/ Arab” or “neo-imperial Europe” are too simplistic to explain the complex interplay of actors and policies in the Euro-Mediterranean political space (Onur and Nikolaidis 2013). To overcome such binary perspectives, the LoA approach concentrates on the very specific (inter-)regional context, asking how material and ideational context-factors shape political processes. We identified three highly interdependent dynamics within the EU, within MENA, and between the two (sub-) regions. Thus, the approach is based on the assumption that the decisive dividing lines transverse the geographical north-south divide, as the dense cooperation in various policy fields between European and Arab governments exemplifies. Digging deep into the complex interplay of transregional interrelations, the LoA approach helps to identify plausible reasons for and driving forces of political developments in the Euro-Mediterranean political space. Jünemann, Annette / Horst, Jakob / Rothe, Delf (eds.) 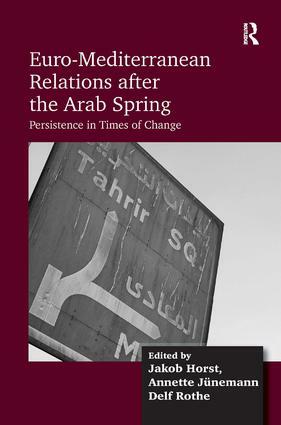 (2013): Euro-Mediterranean Relations after the Arab Spring: Persistence in Times of Change. Farnham: Ashgate Publishers. Jünemann, Annette / Harders, Cilja / Khatib, Lina (2017): Europe and the Arab world: Neighbours and uneasy partners in a highly conflictual context. In: Robert Falkner and Helmut Anheier (eds. ): Special Issue on Europe and the World. International Politics, July 2017, Vol.54, Issue 4, 434-452. ´Rethinking Security in the Euro-Med: Security Policies in the Mediterranean and the Logics of Actions Shaping them´. International conference on „Security in the European Union and its Neighbourhood: Challenges and Policy Responses“, University of Dundee, Scotland, 15-16 June 2015. „Persistence in Times of Change. Security Policies in the Mediterranean and the Logics of Action shaping them.“ ACCESS Europe Workshop: „The European Union and the Arab Spring: Constructions of Security in the southern Mediterranean“, Amsterdam, 13-14 November 2014. „Logics of Action: Ein neuer Ansatz zur Analyse von Stagnation und Wandel im euro-arabischen politischen Raum.“ Presentation at the 18th international congress of the German Middle East Studies Association (DAVO), Berlin 6 – 8 October 2011. II. Research Workshop on Logics of Action in the Mediterranean, organized by Peter Seeberg, 25 June 2011, Odense. I. Research Workshop on Logics of Action in the Mediterranean, organized by Annette Jünemann, Helmut Schmidt University Hamburg, 10 December 2010. Jakob Horst (now Jakob Farah), Delf Rothe, Florian Kühn and Eva Maggi, at that time members of Annette Jünemann’s team at HSU, together developed the LoA approach, inspired by colleagues whose contributions are collected in the book “Euro-Mediterranean Relations after the Arab Spring: Persistence in Times of Change”. · and provide an innovative understanding of (human) security that also includes the perspectives of southern Mediterranean actors.